California Umbrella Pagoda Styled Patio Umbrella - 8'6"
HomePatio UmbrellasCalifornia Umbrella Patio and Market UmbrellasCalifornia Umbrella Pagoda Styled Patio Umbrella - 8'6"
California Umbrella classic and timeless pagoda style patio umbrella is a fun and fanciful staple of California Umbrella's history. Since 1946 this eye catching design has garnered the attention of people all over the world. The exciting color combination's that define this vintage patio umbrella still offer the most dramatic expressions for any outdoor space. Steel wire ribs complete a perfect patio style umbrella canopy and the simple crank open frame makes this visually stimulating design easy to use. Have fun with your own color combination's or add tassels to give your creation even more appeal. The California Umbrella eight foot six inch pagoda styled umbrella canopy comes in a wide variety of Sunbrella colors plus express color choices can be shipped faster so you can enjoy this beautiful pagoda styled umbrella as soon as possible. Please note that all umbrellas are sold without the base due to excessive weights and shipping charges which oftentimes run as much or more that the umbrella price alone. 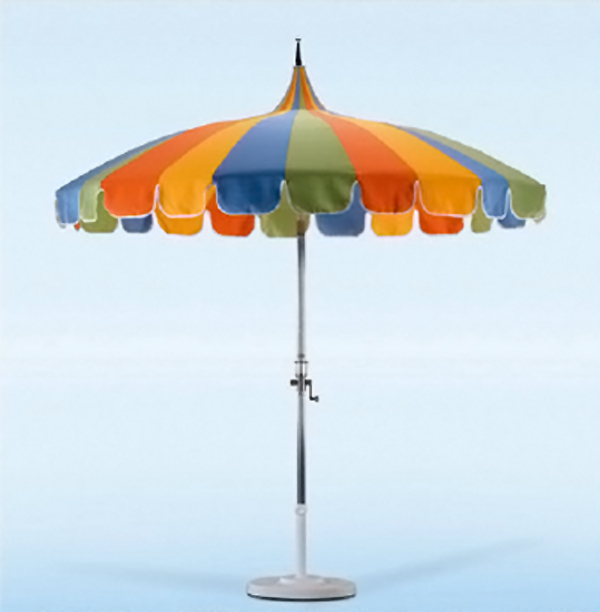 Please note that the Pagoda style umbrella can be made in any combination of two individual Sunbrella fabric colors or simply be made in only one color. If you only want a single color then chose item 1 under the color options and leave item 2 the Second Sunbrella color blank. A selection of color and patterns can be found at the Sunbrella Fabric Showroom located by clicking on the Sunbrella logo at the bottom of this listing. Head over to the Furniture Outdoor Fabric Section and be sure to write down your desired Sunbrella Fabric Color and the Sunbrella Fabric Number and make that choice under Item 1 in the selection area of this listing.